Scott Pierce joined Dunes Properties in 2018, bringing with him more than two decades of experience in sales, marketing, finance and technology. He holds a BS in Accounting, an MBA in Decision Science & Finance, and is a seasoned CPA and CFP®. Prior to becoming a Realtor® in 2017, Scott was an executive for Verizon Communications where he had a variety of positions including Global Operations, Customer Service, Mergers & Acquisitions, Division CFO, and Business Analytics. Throughout his tenure with Verizon, Scott and his family relocated several times, experiencing many parts of the U.S. They would routinely visit family in the Southeast, especially Charleston and the Isle of Palms. After visiting and renting for over five years, Scott and his wife decided to make the move and call Charleston their home. 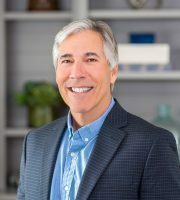 Upon moving to Charleston, Scott relocated Pierce Financial Planning & Consulting, LLC and started Isle of Palms Consulting, LLC, which he still manages as part of his real estate and financial planning activities. When Scott is not assisting clients, he enjoys spending time traveling, running on the beach, and exploring Charleston with his wife, Jennie. They have two grown children who live and work out West in ski country.